NASA's Mars rover Curiosity is a mosaic of photos taken by the rover's Mars Hand Lends Imager taken on Sol 85, the rover's 85th Martian day, as Curiosity was sampling rocks at a stop dubbed Rocknest in Gale Crater. Image released Sept. 26, 2013. NASA's Mars rover Curiosity has found that surface soil on the Red Planet contains about 2 percent water by weight. That means astronaut pioneers could extract roughly 2 pints (1 liter) of water out of every cubic foot (0.03 cubic meters) of Martian dirt they dig up, said study lead author Laurie Leshin, of Rensselaer Polytechnic Institute in Troy, N.Y. The new study is one of five papers published in the journal Science today (Sept. 26) that report what researchers have learned about Martian surface materials from the work Curiosity did during its first 100 days on the Red Planet. Curiosity touched down inside Mars' huge Gale Crater in August 2012, kicking off a planned two-year surface mission to determine if the Red Planet could ever have supported microbial life. It achieved that goal in March, when it found that a spot near its landing site called Yellowknife Bay was indeed habitable billions of years ago. But Curiosity did quite a bit of science work before getting to Yellowknife Bay. Leshin and her colleagues looked at the results of Curiosity's first extensive Mars soil analyses, which the 1-ton rover performed on dirt that it scooped up at a sandy site called Rocknest in November 2012. SAM also determined that the soil water is rich in deuterium, a "heavy" isotope of hydrogen that contains one neutron and one proton (as opposed to "normal" hydrogen atoms, which have no neutrons). The water in Mars' thin air sports a similar deuterium ratio, Leshin said. "That tells us that the dirt is acting like a bit of a sponge and absorbing water from the atmosphere," she said. At left, a closeup view of the Mars rock target Rocknest taken by the Curiosity rover showing its sandy surface and shadows that were disrupted by the rover's front left wheel. At right, a view of Mars samples from Curiosity's third dirt scoop after it was seived. Image released Sept. 26, 2013. Instead, Leshin said, they were probably produced when organics that hitched a ride from Earth reacted with chlorine atoms released by a toxic chemical in the sample called perchlorate. "Perchlorate is not good for people. We have to figure out, if humans are going to come into contact with the soil, how to deal with that," she said. "That's the reason we send robotic explorers before we send humans — to try to really understand both the opportunities and the good stuff, and the challenges we need to work through," Leshin added. This image depicts the science result from the Mars rover Curiosity's CheMin instrument, showing an X-ray diffraction of the rover's fifth scoop of Martian dirt. The black semi-circle at the bottom is the shadow of the beam stop. Image released Sept. 26, 2013. The four other papers published in Science today report exciting results as well. For example, Curiosity's laser-firing ChemCam instrument found a strong hydrogen signal in fine-grained Martian soils along the rover's route, reinforcing the SAM data and further suggesting that water is common in dirt across the planet (since such fine soils are globally distributed). Another study reveals more intriguing details about a rock Curiosity studied in October 2012. This stone — which scientists dubbed "Jake Matijevic" in honor of a mission team member who died two weeks after the rover touched down — is a type of volcanic rock never before seen on Mars. However, rocks similar to Jake Matijevic are commonly observed here on Earth, especially on oceanic islands and in rifts where the planet's crust is thinning out. "Of all the Martian rocks, this one is the most Earth-like. It's kind of amazing," said Curiosity lead scientist John Grotzinger, a geologist at the California Institute of Technology in Pasadena. "What it indicates is that the planet is more evolved than we thought it was, more differentiated." The five new studies showcase the diversity and scientific value of Gale Crater, Grotzinger said. They also highlight how well Curiosity's 10 science instruments have worked together, returning huge amounts of data that will keep the mission team busy for years to come. 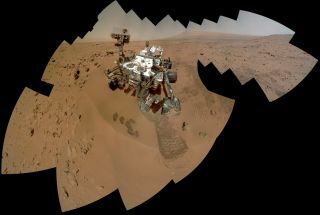 "The amount of information that comes out of this rover just blows me away, all the time," Grotzinger told SPACE.com. "We're getting better at using Curiosity, and she just keeps telling us more and more. One year into the mission, we still feel like we're drinking from a fire hose." The pace of discovery could pick up even more. This past July, Curiosity left the Yellowknife Bay area and headed for Mount Sharp, which rises 3.4 miles (5.5 kilometers) into the Martian sky from Gale Crater's center. Mount Sharp has been Curiosity's main destination since before the rover's November 2011 launch. Mission scientists want the rover to climb up through the mountain's foothills, reading the terrain's many layers along the way. "As we go through the rock layers, we're basically looking at the history of ancient environments and how they may be changing," Grotzinger said. "So what we'll really be able to do for the first time is get a relative chronology of some substantial part of Martian history, which should be pretty cool." Curiosity has covered about 20 percent of the planned 5.3-mile (8.5 km) trek to Mount Sharp. The rover, which is doing science work as it goes, may reach the base of the mountain around the middle of next year, Grotzinger said.